This week we are reviewing the Bullard USRX Technical Rescue Helmet. This helmet has an Outer Shell made from high-heat Ultem thermoplastic provides excellent impact and penetration resistance. It is also dual certified to meet requirements for structural firefighting operations. More details on the construction of the helmet are at the link we have provided at the bottom of the page. 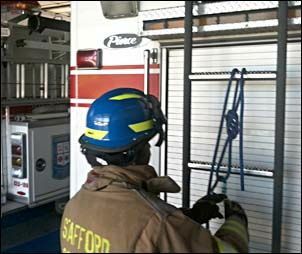 The helmet was field-tested by members of the Falmouth Volunteer Fire Department in Stafford County. Their collated comments and experience with the helmet are included here. During the three weeks that we have been testing Bullard USRX Helmet, we were very impressed with the results. The goggles were quick and easy to utilize and fit snugly. "The fit of the helmet was good. It provided adjustability for multiple users and compared well to the other technical rescue helmets I have used." Overall, the helmet is a great option for your fire, EMS, and or technical rescue needs. Need more info and details about this helmet?